Correction: A previous version of this story incorrectly said Lookout Mountain's hotel-motel tax rate was 8 percent. It is 3 percent. Without a specific funding plan, the Lookout Mountain, Georgia, city council promised not to raise taxes to build a $3 million town center. 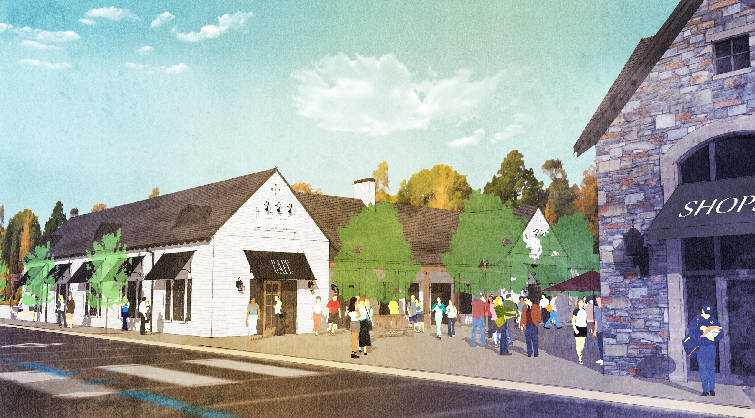 During a special called meeting in the Lookout Mountain Club Ballroom on Monday evening, the council unveiled architectural renderings for the project, which would include a new city hall, fire station and police station close to where the current buildings stand. The city also hopes to sell property in front of city hall to one or two private companies interested in developing shops and restaurants. Monday's meeting was another step in an 11-year process to enliven the area around 1214 Lula Lake Road. Document: An overhead view of the proposed Lookout Mountain, Georgia, city hall, grocery store, cafe and shopping center. "We believe that the community is very supportive," Mayor David Bennett said. "We're very excited, and we're ready to move forward." The council's next priorities are nailing down a funding plan and finding developers who want to build the retail spaces. Vice Mayor Jim Sabourin said city officials are considering issuing a bond or requesting a low-interest loan from the U.S. Department of Agriculture. He said the city has $1.5 million in reserve funds, which the council may be willing to dip into. Beyond that, Bennett said the city council can pay back the debt through the city's 3 percent hotel-motel tax or the 1 percent Special Purpose Local Option Sales Tax. He said the council soon will issue requests for proposals to developers. If they don't receive a commitment, they will prepare the land for a build-out later. "Regardless of what we do, we will continue to seek public input," Sabourin said. "We will be transparent throughout the process. And most importantly, we have all taken an oath that we will act in the public's best interest." The city council first considered building a town center after a fire destroyed the Mountain Market in August 2007. The market sat in front of the current city hall. Former Mayor Tommy Gifford said the council and the business' owner, Scott Maclellan, planned to work together with an architect to build out the new project, giving all the buildings the same look. When the recession hit, Gifford said, the project fell apart. Lenders were less enthusiastic to hand out low-interest loans, and the council would have needed to raise property taxes. "It would have been unconscionable to people," Gifford, a supporter of the new proposal, said Monday. "They're struggling, losing their jobs and looking for work. What are we doing spending millions of dollars on a new town center." Even so, the council still took steps toward building a new town center. In January 2008, at the suggestion of consultant Phil Walker, the city decided to move its public works department. Bennett said that Walker advised shoppers and diners would not want to look at garbage trucks and trailers. Later, Maclellan decided to drop out of the town center plans, and the city purchased his plot of land for $270,000 in March 2012. Around that time, the city issued requests for proposals for submissions for a town center plan. They received a couple of different competing ideas, some of which included property tax hikes. But, Bennett said, city leaders did not prioritize the development. The plan dwindled for several years. According to the plans released Monday, Lookout Mountain will rebuild its city hall in its current location. The fire and police departments, which sit behind city hall, will move to a location directly to the west, where the public works department used to operate. The retail spaces would sit in two buildings in front of the city hall. Bob Franklin, the architect on the project, said the outside of the buildings will consist of stucco, stone and painted brick. The city would build a road that loops around the development — including the space where the police and fire departments now stand. The road would also include parking spaces. A couple of residents, who did not provide names, criticized the plan for creating a traffic nuisance in the city. "You're perhaps inviting accidents," one man said. "If it's successful and those shops go up and there's lots of people coming in and out of those parking spaces, it is going to be a problem. It's one thing to say, 'Well, maybe I can slow down.' But it's another thing to create a potential for hazard." Real estate agent Jack Webb said the town center will attract younger homeowners who weigh Lookout Mountain against the North Shore and downtown Chattanooga. He said new families value experience and activity more than just big homes and quiet neighborhoods. "They want to be close to the center of the action. The more desirable we can make Lookout Mountain, the more we'll be in play. I think all of y'all know, we're in direct competition."